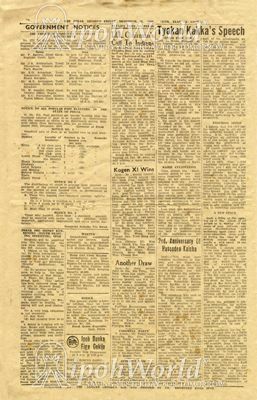 This is a Japanese propaganda newspaper from the 22nd of December 2604 (1944). It was printed in Ipoh during the Japanese Occupation and cost 7 cents at the time. 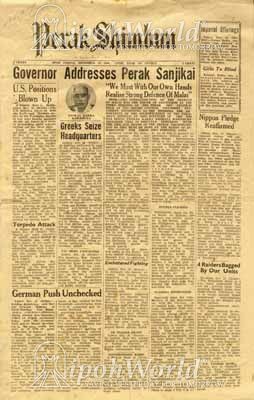 Its articles mostly talked about the war which, wrongly, was said to be going on in favour of the Japanese such as the headline here “Governor Addresses Perak Sanjikai”. Tyokan Kakka Naokata Kawamura struck a chord that the strengthening of the defence of Malai (Malaya) was very important as the life and death of the people themselves were concerned. To see another copy of Perak Shimbun with an explanation of the date, click here.